The National Organization for Marriage is doomed to collapse. 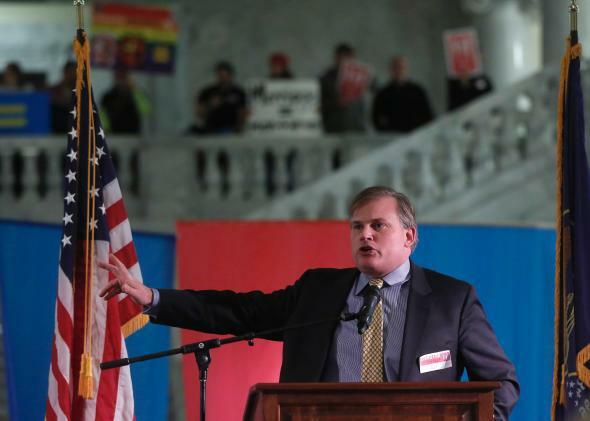 Brian Brown, president of the National Organization for Marriage, addresses supporters at Utah’s State Capitol building on Jan. 28, 2014. This dismissal would be embarrassing enough on its own. Yet 2014 has brought NOM so many defeats that its IRS loss barely made the news. The day after Judge Cacheris’ ruling, the U.S. Supreme Court swatted down NOM’s attempt to halt gay marriage in Oregon, where the attorney general has refused to defend the state’s recently invalidated ban. (Before that, the group tried, and failed, to make a last-minute defense of the law in district court.) These two failures come on the heels of NOM’s most humiliating month yet: In May, the Maine Ethics Commission hit the group with a $50,250 fine for breaking state laws in its 2009 campaign to overturn marriage equality. The commission went on to note that NOM had also likely violated campaign disclosure laws in New Hampshire and Iowa. The Iowa Ethics & Campaign Disclosure Board is currently investigating the group. Was it inevitable that NOM would fall apart so quickly? As the organization stumbles toward irrelevance and impotence, it’s easy to forget just how successful and formidable it once was. The campaign for Proposition 8—which, as I’ve written, was by far the most traumatic and degrading anti-gay event in recent American history—was led, in large part, by NOM. After its success in California, the group took its tactics on the road, successfully batting away marriage equality in Maine and North Carolina while exacting revenge on judges who dared to uphold legal equality. Through these campaigns, NOM rewrote the modern anti-gay playbook, demeaning the LGBTQ community as promiscuous, predatory, diseased, and disordered. From 2007 to 2011—in retrospect, the last successful charge of the anti-gay warriors—NOM released an unremitting stream of noxious nonsense that successfully poisoned Americans’ views of gay people. By May 2012, after North Carolinians forbade gay marriage in their state constitution, NOM could make the case not just that it was winning, but that it had very nearly won. And then, the very next day, it all started toppling down. Less than 24 hours after the North Carolina defeat, President Barack Obama became the first sitting president to endorse marriage equality. Six months later, Obama won the election—and three states gained gay marriage by popular vote for the first time in history. The following June, the Supreme Court struck down the Defense of Marriage Act and undid NOM’s damage by handing gay marriage back to California. Since then, not a single marriage equality case has lost in the courts, and today gay marriage is either legal or soon to be legal in 29 states and the District of Columbia. From all we know about Americans’ views on gay rights—the inclination toward personal liberty, the undeniable draw of equality—this cascade of victories was pretty much predestined. What’s much less clear is why NOM has imploded so easily. Its speedy decline from a well-funded foe to a pathetic laughingstock can’t be blamed solely on a lack of support or a loss in donations, though the organization’s fundraising has withered somewhat. (Not so much, however, that NOM President Brian Brown couldn’t take home a salary of close to $500,000 in 2011, according to IRS disclosures.) Plenty of anti-gay organizations with a fraction of NOM’s operating budget have successfully weathered the post-Windsor era. So why is NOM poised to fold so soon? I can’t know who made the calamitous decisions in Maine, Iowa, and New Hampshire that completely soiled whatever good name NOM still had. But it seems to me that the exact same factors that led to NOM’s success have helped to hasten its decline and fall. From the get-go, the group has simply refused to play by the rules, displaying a brash disregard of both law and custom. For years, NOM refused to release various financial reports, instead electing to challenge disclosure laws in court—a costly and quixotic quest that the Supreme Court clearly doomed to failure. At every turn, NOM has played dirty, illegally keeping its donor lists secret and actively hiding its fundraising reports from ethics commissions. Its unprecedented campaigns against equality-minded judges represent a shocking encroachment upon judicial independence. And its constant barrage of ad hominem attacks against LGBTQ Americans turned a political campaign into a vicious assault on gay people’s dignity. All these tactics worked in 2009. But throughout its brief reign of terror, NOM never considered that its wrongdoing might one day come back to haunt it. Rather than play the long game, the organization chose to bag as many wins as possible while it still had a chance. That was a fine strategy for a while. But as each win is reversed by the judiciary, NOM has nothing left but a record of morally repulsive smear campaigns and a trail of legal misconduct. Rather than stick around and defend a dwindling number of anti-gay holdouts, NOM is stuck paying out fines and fighting off ethics violations. This is how the group can expect to spend its twilight years. At this rate, its impending demise may well come as a relief.